Sassy Cheryl's Digi Stamps Challenge Blog: Challenge #58 Bold and Bright! I don't know about your part of the world, but here in my neck of the woods we are sure ready for SPRING, flowers blooming and some color! Hopefully our challenge today, BOLD and BRIGHT, will help to make the Winter doldrums skedaddle! But before we get to that, let's see who our lucky winner is! And that lucky number 5 is Denise P!!! Just email Sassy Cheryl to make arrangements for your free digis. Enjoy them, Denise! We look forward to seeing your new digis and creations. but we should be back on track now. Now, here's our Sassy Bold and Bright creations! Oh, I know I'm going to love this challenge. BOLD AND BRIGHT. How fun!!!!!!!! Wow, what a beatiful cards from the design team. They are realy beautiful! The Lama makes me laugh. 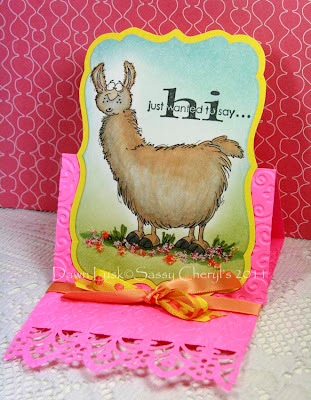 What a fun stamp ;-) I hope to join you again with this weeks challenge. Ladies, these card are awesome and bold and bright are my middle names. Just hope that I can get a card made in the next day and a half. I'd hate to miss this one. All the cards displayed here are awesome. I hope my card meets your requirements. I just had so much fun coloring this image i had to share. I took your advice, Cheryl, and entered my card in the challenge. Thanks for the heads-up! Fun challenge..I'm loving the inspiration! Y E S, I am feeling Bold and Bright!! Please remove post #4. It was not the correct link. Another great challenge. Thank you. Great challenge - I'm ready for Spring! Just sent my link! Good luck in the drawing ladies. Thanks for taking part in the challenge this week with your amazing cards!